A companion to the bestselling "Dad's Army: Walmington Goes To War" (Series 1-4), "Dad's Army: The Home Front" covers series 5-8 of the much-loved TV sitcom. These complete illustrated scripts also contain introductions to each episode by the actors, writers and producers of the series. Dad's Army is quite simply the most successful British TV sitcom of all time. Eighty episodes were made and are constantly repeated. The first black-and-white series, re-shown for the first time in 1999, attracted 4.6 million viewers, outperforming 'Have I got News for You' and almost outstripping Channel Four's most popular programme, 'Friends'. When the second series was shown on Saturday nights in 1998 it took 7 million viewers and 40 per cent of the audience. Almost every comedy writer from Ben Elton and Richard Curtis to John Sullivan and David Renwick pay homage to this 'the perfect sitcom'. When BBC centre was blacked out on Tuesday 20 June for the first time in 40 years by a power cut Dad's Army was drafted in to save us from blank screens. Dad's Army is simply an icon in TV comedy. 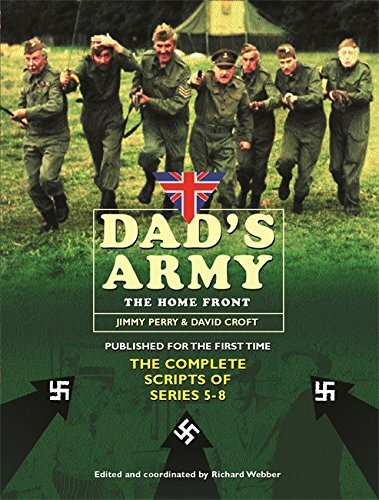 A companion to the bestselling 'Dad's Army: Walmington GoesTo War' (Series 1-4), 'Dad's Army: The Home Front' covers series 5-8 of the much-loved TV sitcom. Published for the first time, the complete illustrated scripts also contains introductions to each episode by the actors, writers and producers of the series.